Image provided by Jeff Niu. While Beijing is the second largest Chinese city and one of the most popular Chinese cities for expatriates, it can often be difficult to find hybrid spaces that appeal to both foreigners and local communities. A popular weekend spot and tourist destination, Sanlitun, is perhaps Beijing’s most glamorous district. It is known for its collection of high-end stores, high-rise hotels, and vibrant international food and beverage (F&B) scene. It thus sits at the forefront of China’s growth in the HRI market (hotel, restaurant, institutional), which is projected to rise to 15 percent of global market share by 2020, second only to that of the United States. F&B is a particularly telling industry when it comes to catering to local or foreign tastes, with very few business successfully blending Chinese and global influences. 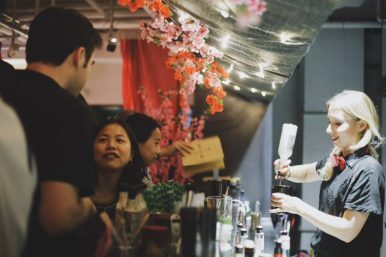 Jeff Niu and Maithe van Luijk, former Yenching Scholars and Master’s students in Beijing, decided to host their own pop-up bar with a two-pronged goal. First, they wanted to create a conceptually authentic, fresh space that resonated with both expat and local communities, exploring what was possible in bringing different communities together in a hybrid space. Second, they aimed to to prove that sustainable, conscientious businesses can appeal to customers in an unobtrusive way, particularly in the F&B space, in the more unexpected form of a cocktail bar. Niu brought his experience as a business designer, having worked in the Beijing startup scene since 2013. Van Luijk came to Beijing with a strong background in F&B after having earned a reputation as one of the top bartenders/mixologists in the Netherlands. Niu and van Luijk set their sights on sustainability and relevance to Beijing in both taste and meaning by sourcing local ingredients and flavors and using wordplay in both Chinese and English to appeal to locals and foreigners alike. They settled on “Yutopia 桃花源,” a pop-up bar to be hosted at The Crib (Yu, 育膳房) in Sanlitun. While referring to the English word, “utopia,” the characters reflect the relevant Chinese conception of utopia, peach blossom springs 桃花源. Considering the saturation of F&B in Sanlitun, local partners play a large role in entrepreneurship in the sector. Some venues, including The Crib, specifically aim to help entrepreneurs in the F&B industry to set up a business in popular (and therefore expensive) districts while reducing the difficulties in registration, space constraints, and high rent. The Crib reduces overhead costs for startups in the F&B space by one-third to one-half. Part of Niu and van Luijk’s wordplay included The Crib’s phonetic “Yu” in the first part of the bar’s name, “Yutopia,” to reference the importance of local support and to emphasize the bar’s roots in China. A key piece of Niu and van Luijk’s project was using local materials. Despite their efforts to exclusively use sustainably sourced ingredients, Niu and van Luijk discovered the difficulties of finding high quality, sustainably produced domestic spirits. Beyond China’s most well-known and popular liquor, Baijiu, the Chinese spirit industry is dominated by foreign companies. However, these companies have very limited distribution within China, and struggle to grow their brand even within first tier cities such as Beijing and Shanghai. Similar to other foreign enterprises, these F&B brands have not been able to successfully navigate the Chinese market, and must rely on local distributors who usually represent multiple clients. Thus, there are plenty of entrepreneurial opportunities for co-branding and partnerships that have yet to be explored at a wider scale. The biggest challenge for these brands is to localize how they expand distribution. Drinks, even without local roots, can still pay homage to Chinese culture and tradition. Niu and van Luijk designed the menu to highlight Chinese flavors and ingredients, with each drink featuring at least one prominent Chinese ingredient. Common base ingredients included candied hawthorn, white rabbit candy, and Beijing’s Arctic Ocean soda. The containers themselves also had meaning, one using an emptied dragon fruit half (the fruit itself used in a separate cocktail), and another repurposing iconically common porcelain yogurt bottles. Upon opening the “Map to Yutopia” (the menu), you’ll discover a series of questions that will help you find your final destination, or cocktail recommendation. Each of the six drinks corresponds to a different sustainable concept — Reduce, Reuse, Recycle, Share, Bring Your Own, and Go Natural. For example, my first cocktail was the Pekin’ Poppin’. Served in a lightbulb glass, this cocktail features a spritzy combination of Campari, Beijing soda, and orange bitters, served with a flamed orange peel garnish and a straw covered with popping candy. Why a lightbulb? According to its designers, this Reduce drink aimed to encourage minimizing electricity usage at home, since all other forms of energy consumption in Beijing are controlled by a central grid. Another cocktail is the All is Pear in Love and Bar. Served out of a link of bamboo, this earthy cocktail combines rum with ginger root, pear nectar, and rock sugar to encourage consumers to Go Natural. Although Yutopia is not currently open in Beijing, Niu and van Luijk discovered the potential for pockets of concepts where locals and expats can mingle, and are hoping to again become a facilitator of these exchanges. Most importantly, their insight into the overall lack of such hybrid spaces points to the cultural gap between young urban professionals in both the local and expatriate communities in China. Even though F&B is a difficult place to start, it may be the best place for these conversations, especially those around alcohol in a yogurt cup. To learn more about Yùtopia, contact Jeff Niu via his LinkedIn and Maithe Van Luijk via her website.